Congratulations! If you have reached the Final Rose portion of your long and arduous journey down the disappointment-strewn path that leads to the crumbling steps of the abandoned temple of ForeverLove, you deserve some recognition for the accomplishment. You have fought, and you have suffered, and you have consumed enough bargain-bin chardonnay to render a grape-blinded Bacchus himself flaccid at the very thought of quaffing another goblet. We at Bachelor School raise a glass to you, for you have so effectively deployed our Advanced Learning Plan that you now stand, rose-cheeked and queasy-stomached, before the temporary soul mate of your onetime dreams. So, again: congratulations. Standing shoulder-to-shoulder with just one other sister-contestant is an impressive accomplishment in itself, even if — as you might have already begun to fear deep down, in the horrible places Chris Harrison would rather you not explore without his dark guidance — you’re starting to wonder if this is a man to whom you’d like to be pretend-engaged for the suggested four-to-six post-show months. Despite Harrison’s incessant whispers to the contrary, doubts are natural, and they are powerful. And they should be explored before you’re locked in a windowless room with a network-mandated Betrothal Consultant, choosing from a list of approved, rose-embossed china patterns in preparation for a televised wedding scheduled 10 months hence, and fighting the urge to slash your way out with a shard of a demo-saucer. Ask those questions now. Question your feelings. Sometimes the only way to win is to run the eff in the other direction like your Bachelor is offering you a long-stemmed stick of hissing dynamite. Here are your final lessons for a final rose. Good luck. A general note about red flags: They are a warning, not an invitation. When you spot one, it’s not a helpful pirate’s way to indicate there is treasure nearby. Historically, treasure has been buried deep in the ground, so that only those with detailed maps have any chance of finding it. So if, in a brief moment of clarity, you spot a red flag jutting from your Bachelor’s shirtless torso, or planted in the ground next to the couch upon which you are trading conversation for besitos, you are not about to embark upon a potentially enriching dig for interpsonal gold. You are teetering on the edge of an emotional sinkhole, wondering about how bad it would really be if you “accidentally” fell in. Count up the red flags. If they exceed the number of roses you’ve acquired, consider the possibility that this Bachelor might not be the right Bachelor for you. If you feel something, say something. To yourself, in the bathroom mirror, away from the camera crew. Such as: “I find it at least mildly troubling that the two most levelheaded women on this show have voluntarily removed themselves from this competition. At first it was like, ‘Great, more for me!,’ but then it was all, ‘Do they know something I don’t? '” You may decide not to take your gut’s advice, but you’ve at least heard it. And if the wup wup wup wup wup sound echoing in your head is making you sick instead of consumed by the possibility of making love under whirring helicopter blades as your pilot pretends to fiddle with some dashboard knobs, maybe your gut’s at least manged to communicate an important message to your brain. You probably won’t have access to the Final Rose viewing party studio audience until it’s too late, but it can be a helpful visualization exercise to imagine their reactions to what’s happening to you as the action unfolds in the candlelit expanse of the Bachelordome. Do you think they’re groaning like a stadium crowd after a paralyzing hit on a defenseless wide receiver going over the middle? Can you almost hear their rapturous cheers if you decide that rather than listen to yet another unsatisfying, circular explanation of why you don’t meet your Bachelor’s selection criteria, instead you should shove him away and publicly question his manhood? Turn away from the groans. Walk toward the cheers. The crowd demands a sacrifice. Make sure it’s his broken body they’re celebrating, not yours. We know, we know. 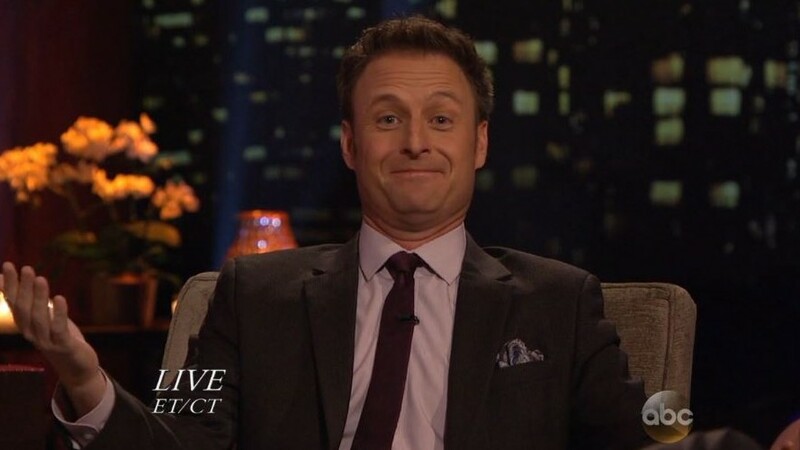 We’ve spent the entire season reinforcing the (still correct, incidentally) idea that Chris Harrison is a rose-eating, black-suited Beelzebub whose only job is to materialize from a dank cloud of ruined souls at pivotal moments to lure you to your spectacular doom. But life often requires one to make strategic deals with the devil. And this prime-time hell-satyr requires good television above all. Confrontation makes for good television. A shifting narrative makes for good television. A dethroned king who doesn’t yet realize he’s been stripped of his scepter makes for good television. Feed him your Bachelor’s soul and he might spare yours. He will happily turn on your now-vulnerable Bachelor at your command, doing his best to ruin the fledgling relationship that your Bachelor seems totally unwilling to confirm under the contractually mandated spotlight of a three-hour finale event. (The devil hates nothing more than a broken contract.) “Tell her you love her!” he’ll demand, igniting pillars of infernal flame around the dais upon which that unacknowledged love will soon die. “This is the good stuff! Just say it!” Sheepish smiles will melt from frozen faces. The studio audience will sharpen their knives. Viewers in the ostensible safety of their own homes will cringe from the heat of his fury. “Three little words, you insolent worm!” he will scream, his eyes engulfed in righteous fire as the studio crumbles around him, collapsing under the weight of broken promises. And we will have to wait until next season for another chance at ForeverLove. Come on. It’s pretty cramped in there. Wup wup wup wup wup.